* This review contains spoilers if you haven't watched the complete Avatar: The Last Airbender TV series. To Sum It Up: With the help of his friends, Avatar Aang finally brought an end to the war. But there’s growing unrest in the Earth Kingdom, where Fire Nation colonists who have been ordered to return to the Fire Nation are prepared to defend their homes and their way of life. Newly crowned Fire Lord Zuko wages a fierce internal battle with himself on how to handle the situation and is ever fearful of becoming like his father. As conflict between the Earth Kingdom and the Fire Nation seems inevitable, it’s up to Aang to find a peaceful solution once more. Review: WARNING: lots and lots of fangirling ahead! I can’t help it—Avatar: The Last Airbender is my current obsession, and said obsession knows no satiety. 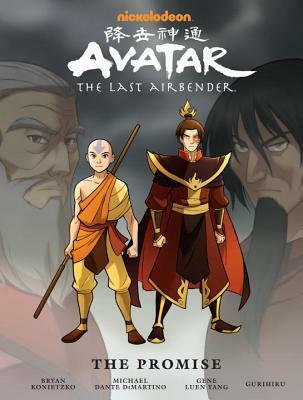 So it’s very, very fortunate that graphic novels like The Promise exist, because I’ve now seen all of the Avatar episodes but still need more, more, MORE! The Promise picks up where the TV series left off. Aang and Zuko (my absolute FAVORITE character. LOVE. HIM.) are working together to restore peace throughout the nations, but there’s trouble a-brewing in the Fire Nation colonies in the Earth Kingdom. To the colonists, they are home, and when they’re ordered to leave the Earth Kingdom to go “home” to the Fire Nation, they are not receptive to the plan. While watching the TV series, I was constantly in awe of the depth and complexity of the story lines, and the main plot of The Promise is every bit as profound as any you’ll find in an Avatar episode. Just because Aang defeated Zuko’s father, Ozai, at the end of the TV series doesn’t mean that the Avatar crew’s work is finished. Undoing all the years of the Fire Nation’s rule isn’t accomplished overnight, and it presents an especially heavy burden for the new Fire Lord, Zuko, on both a political and personal level. Ah, my poor Zuko. Just when you think he might have found a bit of peace at last, his damn father messes with his head. To say the scenes between the two are tense is like saying Aang’s airbending skills are just average. Zuko so badly wants to do the right thing, for his people and for peace between the nations, but if often seems as though he’ll be forced to choose one over the other. The thought of turning into a ruler like his father also figures largely in Zuko’s story arc, and it haunts him so much that you just want to give the guy a hug and assure him that all will turn out well in the end. The artwork throughout The Promise is absolutely stunning and effectively captures the element bending. All of the characters look amazing, and as I read, I could hear their voices from the show in my head. It’s so easy to imagine that you’re in an extended episode of the TV series, back among the characters you love, just like old times (or in my case, like two weeks ago). This particular hardcover edition collects all three parts of The Promise, originally published separately, in one volume and also features margin notes from writer Gene Luen Yang and artists Gurihiru; I totally loved reading their insights. Avatar fans: this is a MUST-READ if you haven’t picked it up already! All in All: Once I started reading The Promise, I could. Not. STOP. It is absolutely worth reading if you loved the show and long for more adventures with the gaang. Zuko is my favorite too, although Aang is such a cutie! It's great that this book gave fans more Avatar. Is there a spin-off? I vaguely remember there being one. Is it as good as this? I CAN'T WAIT EITHER!!!! When Ally and I finished watching the show, she said that Zuko should have gotten his own spin-off, and I TOTALLY agree with her statement. XD But, at least we still have these graphic novels to give us our Avatar fix!